If you’re interested in asking us to review your book, please read our review policy by clicking here. Punctuation..? 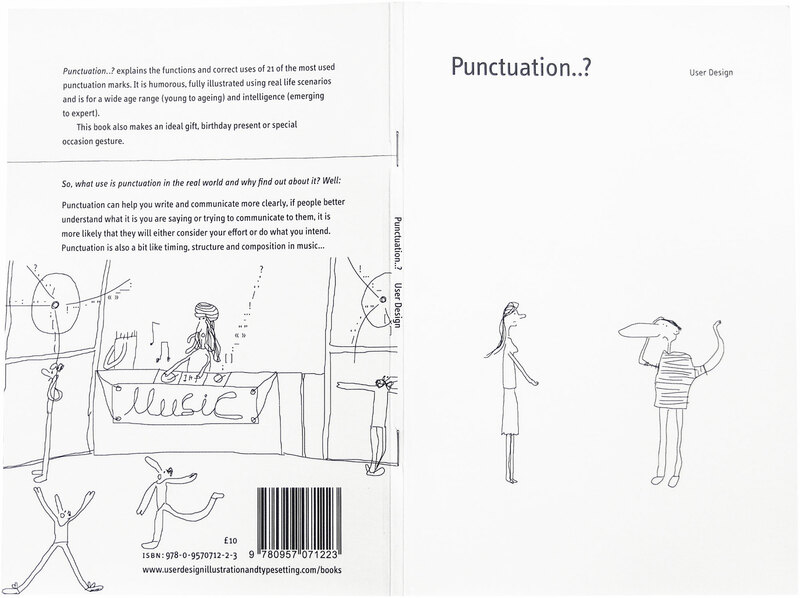 is a charming little pamphlet which looks to share the author’s enthusiasm for punctuation with his passion for drawing. A wide variety of interesting punctuation is described alongside drawings which hope to illustrate the purpose of the mark itself. The benefits of the book are that it looks to describe the function of the mark as opposed to simply focusing on any so called rules. This makes it potentially useful when teaching children. Indeed, what a nice thought that children too could be invited to sketch their impressions of what certain punctuation marks ‘do’ for their writing. An example I particularly liked was about the semi-colon. User Design has what appears to be a young couple separated by some distance across the page. They stare longingly across to each other. Underneath it reads: ‘She looked at me; I was lost for words.’ The image looks to match the function of the punctuation – the separation of two parts of a sentence. Whilst some of the punctuation covered is beyond the requirements of the curriculum, this is no reason not to share and delight in more quirky and less observed punctuation. Why not find out the circumstances for which to use a Guillemets or Pilcrow?